Are you looking to generate more leads for your business? The almighty lead magnet is here to help! A lead magnet is an easily-consumable piece of information that you offer on your website to convert visitors into leads. Also referred to as opt-in bribes or signup incentives, lead magnets demonstrate your expertise and establish trust. As long as your lead magnet delivers a quick win (by helping your visitors easily achieve something), your visitors are totally willing to give you their precious contact info to get it. Your lead magnet should help a specific audience with a specific problem, be delivered instantly, and be consumable within 5-10 minutes. Lead magnets come in many forms, and are most commonly delivered as downloadable PDFs. However, the most powerful format for a lead magnet is: video. Videos are a lot easier for people to consume, provide faster gratification, stimulate more senses and work with more learning styles than basic text-based lead magnets do. If your company’s lead generation isn’t matching your entrepreneurial spirit, here are 3 kinds of videos that will help you get leads. Please note: the following examples are only demonstrations to provide you with ideas. These are, quite arguably, the most useful content that people can find online. They get millions upon millions of views on YouTube every day. Show your visitors that you’ve got a video that’ll help them solve a problem, and you’ll have a powerful lead magnet. It doesn’t have to be a big expensive production, just something that people can consume within 5 minutes. This is an example of a professionally-produced how-to video, with some extra camera angles that help the expert instruct her audience. By the way, this video has 3.5 million views on YouTube. See more examples of “how-to” video lead magnets here. Go from being “another company that says they can solve my problem” in your prospect’s mind to a verified, credible expert they should listen to. Case studies are a beautiful blend of “How-To” info and the all-powerful customer testimonial. Stay focused on the result that was achieved, and people will opt in to find out how they can create the same result. This video is beautifully put together, and clearly communicates how the business (Retrofit) significantly improves the lives of the customer’s (DeVry) employees and makes the business more profitable. See more examples of case study video lead magnets here. Webinars are often used for customer acquisition, but they’re also great for lead generation. You don’t even have to put on a new webinar. People will opt in for recordings, too! Got a webinar recording? 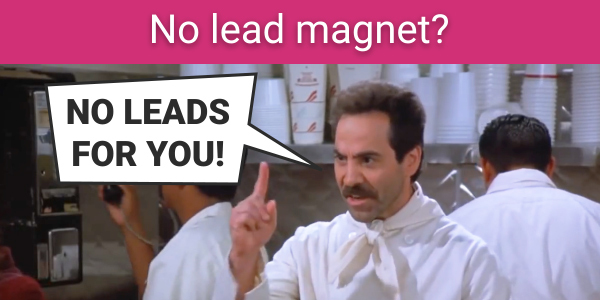 It’ll be the easiest lead magnet you ever made. Show your website visitors a snippet of a recent webinar that gives them value, and they’ll gladly give you their email address to see the full thing. This short and amusing webinar snippet includes screens that encourage the viewer to visit a webpage to view the full recording. See more examples of webinar excerpt video lead magnets here. How would you like to convert those leads into buying customers? This next post will help you do that.